Awaken your wanderlust with a fascinating globe that uses solar energy and the force of the earth's magnetic field to spin, mimicking the rotation of the earth. The MOVA globe turns gently and silently, no batteries or wires required. It’s mesmerizing. Even if you can’t jump on a plane to an exotic location, you can feed your jet-setting dreams with a virtual tour of the world, right on your desktop. The MOVA globe consists of an inner sphere, which is the labeled globe, and an outer acrylic shell. There’s a set of solar cells inside the sphere, and the graphics on the globe allow just enough light to pass through to energize the solar cells and power the globe’s motor. The outer shell is filled with clear fluid, which supports the inner globe and creates a virtually friction-free environment so it can spin. When it’s exposed to natural or artificial light, the MOVA globe starts to turn. 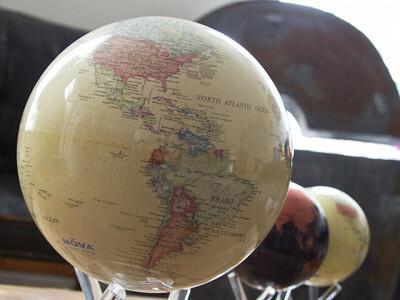 Each globe comes with an acrylic base, or you can opt to buy an extra wooden or crystal base. 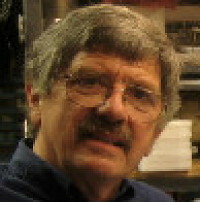 Bill French, the creator of MOVA globes, was fascinated by the idea of earth spinning in space, and he used his expertise in magnetic and solar technologies to recreate the earth's perpetual motion in a handheld model. His invention is inspiring and educational. It makes a great gift for teachers, travelers, new graduates, lifelong adventurers. . . and for yourself. When you need a mental break, you can let your mind wander with the globe and escape to a different part of the world. I spent my whole life inventing the MOVA globe and finally, with a thumbs up from my wife Peggy, allowed myself about 10 years ago to put it on paper, make models, raise money and start a business with my partner, Shaw Lin. The invention was inspired by watching a top spin and thinking about the earth floating and turning in space, energized by the sun. I wish I could live in a world where everything is peacefully powered by ambient energy and the earth's magnetic field, like the MOVA globe. Is there a globe that has no text on it? I would love to see one that is just as it would be viewed from space. Frankly, I get enough of the divisions on a daily basis. A view without all of our imaginary boundaries would be very calming and beautiful. It looks like the Natural Earth model is what you are looking for. Thank you both. I didn't see that one when I looked through the choices. That's exactly what I was looking for. It's on my wish list! I've had a mova globe for just under a year and I didn't know the story. Thanks for sharing that Bill. Very inspiring! um, "for men"? Anyone would want one of these! Mr. French.....These are beautiful! I was an army brat, and loved the globe trotting experiences my father's career afforded us. I still get "sand in my shoes" and want to explore more of the planet. I have to settle for what I find on the internet and on TV. However, I am expecting my first grandchild, and when I can save enough money, fully intend to introduce her to the world in all the ways I can, and that will certainly include one of your wonderful creations! Thanks for your support. We agree and are in love with this Grommet. It's literally a beautiful way to introduce anyone to the world. Have the globes been "drop tested" and if so, by how many feet? We drop tested the globes in their box and packing material from 3 feet, no problem. If you drop the globe, unprotected, then I would guess they will maybe survive a 1 foot onto concrete, maybe 3 feet onto a soft carpet. They are not intended to be dropped. Are the globes or any Grommet items available for wholesale? This would be great for museums stores. Thanks for your question. We sell only retail on Daily Grommet. I'm sure Bill wil be super happy to hear this input though. It was mentioned in the presentation that there was a choice of bases available, yet the three pronged clear plastic one was the only one I saw listed with the purchase options. Where are the other types shown, and how much do they cost? 2 types of bases are available. The square wooden bases can be viewed here and the crystal bases can be viewed here. Hope you like them. I purchased one of these a couple of years ago from Nordstrom and it no longer rotates and I figured it was b/c the kids were playing with it too much. (and maybe it's a different brand???) It looks great on display. Bill can weigh in here on what other brand that may have been, but these are built to last. As Bill says above, they can take some bumps, yet aren't meant to be played with very much. Mostly a beautiful piece to keep on a desk or table, to watch and look at. Cool idea, but is there some reason these globes are not tilted to rotate on the 23-degree angle that the earth rotates? These look weird rotating around the wrong axis. I think you are assuming a view from the sun, and that would show the 23° angle. But there would be no such angle if you were viewing it from somewhere on the plane of the earth's equator. @ Maury Logue good point! I guess I have been trained by the animations I have viewed over my lifetime (not to mention other globes I have seen.) It's still very cool. If we tilt to 23 degrees the globe would need to be perfectly balanced to rotate; this is just not practical. Also, I am thinking the globe looks more peaceful rotating about a vertical axis . I think they are one of the most beautiful things I have ever seen. I have always loved globes and have always imagined myself traveling the world, meeting new people/cultures, and experiencing so much that planet earth has to offer. I am amazed at the feelings watching this evokes from my spirit! I can see my preschoolers little eyes watching in amazement and asking me millions of questions! I absolutely LOVE it!...absolutely nothing negative to say...thank you! of the rotation? Is there a warrantee? I would hope that they would remain functional for at least 10 years. Hi Larr, that's a good question. With proper care and handling, they will last years. The motor is very low-energy so it will spin for a long time. A recipient of one of the first prototypes says his is still spinning after 10 years. Awaken your wanderlust with a fascinating globe that uses solar energy and the force of the earth's magnetic field to spin, mimicking the rotation of the earth. The MOVA globe turns gently and silently, no batteries or wires required. It’s mesmerizing. Even if you can’t jump on a plane to an exotic location, you can feed your jet-setting dreams with a virtual tour of the world, right on your desktop. The MOVA globe consists of an inner sphere, which is the labeled globe, and an outer acrylic shell. There’s a set of solar cells inside the sphere, and the graphics on the globe allow just enough light to pass through to energize the solar cells and power the globe’s motor. The outer shell is filled with clear fluid, which supports the inner globe and creates a virtually friction-free environment so it can spin. When it’s exposed to natural or artificial light, the MOVA globe starts to turn. 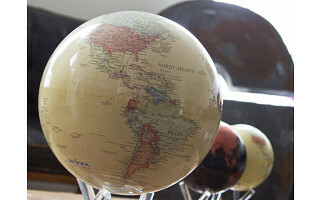 Each globe comes with an acrylic base, or you can opt to buy an extra wooden or crystal base.